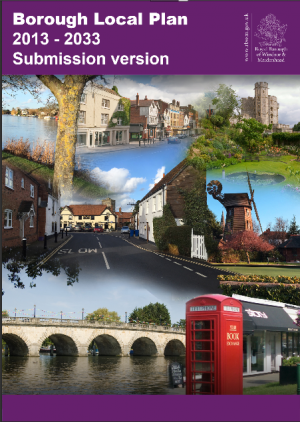 Following the public consultation in December 2016/January 2017, known as ‘Regulation 18’, the Royal Borough of Windsor & Maidenhead (RBWM) published its ‘submission’ version of the Borough Local Plan (BLP) known as ‘Regulation 19’ and invited residents to make further representations (comments). This consultation closed in September 2017. After collating and processing all the representations received, RBWM prepared a report summarising the issues raised and setting out its response to them. This report, together with all the representations received, the submission version of the BLP and its supporting documents, was submitted to the Department for Communities and Local Government in January 2018 for examination by the Planning Inspector. It is expected that a public hearing will take place later this year for the inspector to further explore matters, issues and questions relating to the submitted plan. If the inspector finds the BLP ‘sound’, the plan can then be considered for formal adoption by RBWM council. You can read the submitted plan and documentation on the council’s website: www3.rbwm.gov.uk/blp. An infrastructure delivery plan (IDP) was also published in summer 2017, (and an updated version in January 2018), alongside the submission version of the BLP. This indicated that, if the BLP is adopted, most of the new housing development proposed for Datchet is likely to take place between 2022 and 2033. What does the IDP mean for Datchet? At this stage, the main purpose of the IDP is to identify the infrastructure which will be necessary to support the development proposed in the BLP, and to outline how and when this will be delivered. There will be no detailed proposals or plans available until the planning application stage, which is at least several years ahead. Traffic There are 28 junctions in the borough which are particularly congested and will need ‘remodelling’ if development goes ahead. One of these junctions is at the entry to the Greens at the top of the High Street in the middle of the village. Schools Additional primary school provision will be required in Datchet to support the proposed BLP development. Possible building within Churchmead School’s site to offer extra primary school places is a ‘desktop exercise’ at this stage There has been no direct consultation with schools and there is currently no specific programme of primary school expansion. Cycle network for Datchet and Cycling Action Plan schemes. These are considered of low priority in relation to the BLP. The Infrastructure Delivery Plan does not mention increased General Practice health provision in Datchet, but the GPs and management of Datchet Health Centre are beginning to discuss plans for expanding their services, according to NHS and CCG (Clinical Commissioning Groups) current advice. To read the Infrastructure Delivery Plan which was published in summer 2017 please click here (documents are listed alphabetically). To read the submission version of the BLP, comments and supporting documents, including the January 2018 IDP, please click here. To read comments made about the draft BLP, please click here and click on ‘All Comments’. The Royal Borough’s Local Plan (BLP) will potentially have a very big impact on Datchet in the next few years. The BLP outlines development in the Borough for the next 20 years, including housing targets which have been imposed by central government to deal with the national housing shortage. It was the housing figures which attracted most attention in Datchet. Across three sites, two of them bordering the M4, more than 350 residential units are planned. Whoever thinks this is going to work without affecting this village needs to think again. We cannot take this sort of expansion. Already the people of Datchet have to put up with hundreds of cars who use this village as a short cut and block the roads, especially in the rush hours when the crossings come down and block the whole place. What about the people who live here, yes we do have a ‘say’ which is why I am writing this and the answer is NO I certainly do not want it. Lets keep what is left of the village just as it is ! Do these people who plan these things even live in the South East ? Completely ridiculous plan, Datchet is gridlocked from 4 pm to 7 pm already most evenings. The train crossings are mostly down since they have introduced longer trains. No one appears to be demanding that the platform is extended which at least would allow us to go back to how it used to be.Schools Doctors surgery etc all full. What quality of life would these new houses offer jammed up against the motorway with 3rd runway planes above, completely mad ! Datchet is a village, most people chose to live here for this reason, to make it into a town by adding 20% more housing is a betrayal to the existing residents. The roads are already grid locked during rush hour due to the level crossing and outsiders using it as an alternative rat run from Egham to Slough to avoid the traffic jams on the M25, these will only increase with the expansion of the airport. It is quite obvious that the people responsible for the decision to expand Datchet have no understanding of the area at all and likely do not live here.